The CFM International CFM56 (U.S. military designation F108) series is a family of high-bypass turbofan aircraft engines made by CFM International (CFMI) with a thrust range of 18,500 to 34,000 pound-force (lbf) (80 to 150 kilonewtons (kN)). CFMI is a 50â€“50 joint-owned company of SNECMA, France and GE Aviation (GE), USA. Both companies are responsible for producing components and each has their own final assembly line. GE produces the high-pressure compressor, combustor and high-pressure turbine and SNECMA manufactures the fan, low-pressure turbine, gearbox and the exhaust. The engines are assembled by GE in Evendale, Ohio and by SNECMA in Villaroche, France. The completed engines are marketed by CFMI. The CFM56 first ran in 1974 and, despite initial political problems, is now one of the most prolific jet engine types in the world: more than 20,000 have been built in four major variants. It is most widely used on the Boeing 737 airliner and under military designation F108 replaced the Pratt & Whitney JT3D engines on many KC-135 Stratotankers in the 1980s, creating the KC-135R variant of this aircraft. It is also one of two engines used to power the Airbus A340, the other being the Rolls-Royce Trent. The engine is also fitted to Airbus A320 series aircraft. 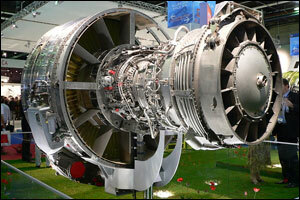 By January 2010 the CFM56 had flown more than 470 million cumulative hours (the equivalent of more than 53,000 years).